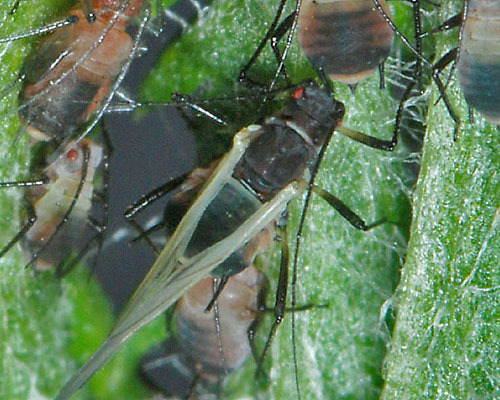 Metopeurum are medium-sized aphids, the adult viviparae of which may be winged or wingless. Antennal tubercles very weakly developed. Siphunculi thin dusky or dark over at least half of length, with polygonal reticulation usually extending over more than distal 20%. Cauda tapering, triangular, less than 1.5 times longer than its basal width. There are 11 species in the Metopeurum genus, living primarily on daisies (Asteraceae). They have a sexual stage in the life cycle overwintering as eggs, but there is no host alternation. They may be attended by ants. 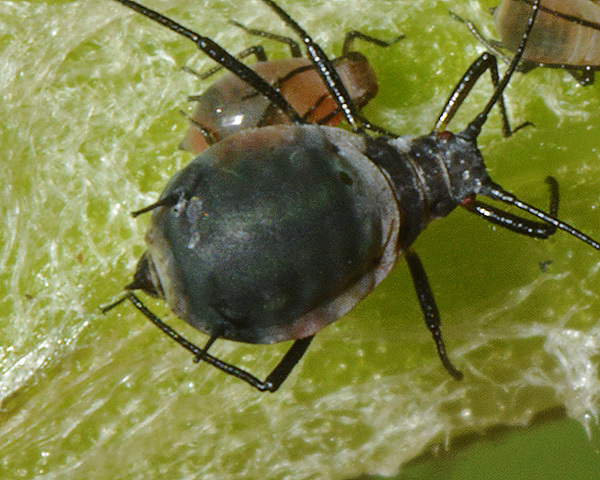 Metopeurum fuscoviride is a medium-sized pink or greenish aphid with a large black dorsal spot on the abdomen. It has no wax powdering and no marginal sclerites. The antennal tubercles are very weakly developed, so that the front of head is very shallowly concave. The antennae are 0.9-1.1 times the body length, with a terminal process that is 3.3-5.5 times the base of segment VI. The fused apical segment of the rostrum (RIV+V) is 0.7-0.8 times the length of the second hind tarsal segment (HTII). The siphunculi are dark and thin and 1.3-2.0 times the length of the cauda. The cauda is dusky or dark, elongate triangular with a rather narrow apex, less than 1.7 times longer than its basal width. The body length of Metopeurum fuscoviride apterae is 2.2-2.9 mm. The alate has marginal sclerites on the abdomen, at least on segments I-III, but the abdomen is otherwise unsclerotized. The siphunculi are 1.2-1.8 times the length of the cauda. The pink tansy aphid feeds on tansy (Tanacetum vulgare) and there is no host alternation. Large colonies can sometimes develop near the stem bases where they are regularly tended by ants, of which Lasius niger is the most common. Sexual forms develop from August onwards, and the species overwinters in the egg stage. Metopeurum fuscoviride is found throughout most of Europe.